Unit 2, 339 London Road. Possibly since 1980s. 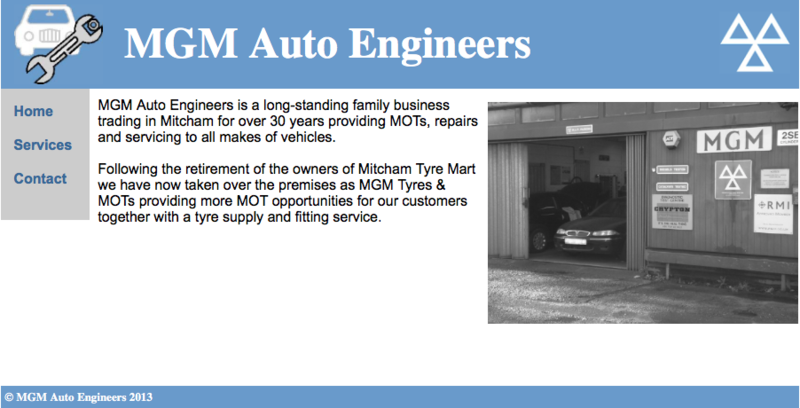 See current website for MGM Tyres and MOTs. 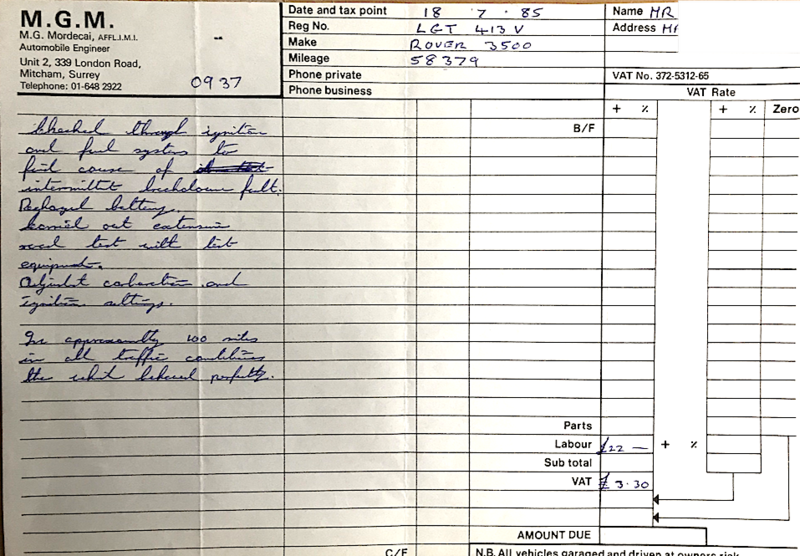 This entry was posted in Garages and tagged 1985 on March 12, 2019 by Mitcham Historian. Tyres etc. 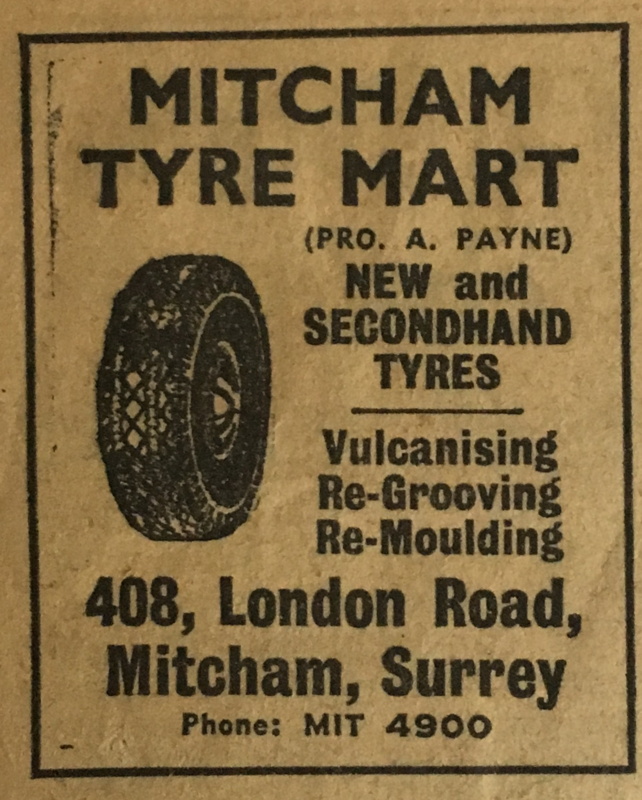 service since 1934.
ad from Mitcham and District Advertiser, 3rd January, 1963. When the owners retired around 2013 the premises of Mitcham Tyre Mart at 339 London Road, CR4 4BE, were taken over by MGM. Screenshot of MGM Services website, dated 2013, in case it is taken down. This entry was posted in Garages and tagged 1934, 1952, 1963, tyres on January 16, 2019 by Mitcham Historian. Motor dealer and garage near the Swan pub on the western side of London Road, south of Eveline Road. Business owned by Bertie Cyril DENDY. He was married on 3rd August 1910 to Lilian Beatrice Mary MANSFIELD, aged 25, of 7 Spencer Road, Cottenham Park, Wimbledon. Her father is shown on the marriage certificate as Thomas Mansfield, carpenter. Bertie Dendy, also at the same address has his occupation shown as Coach Builder, the same as his father Adolphus. His father Adolphus is listed in the 1915 street directory as a wheelwright at The Oakwoods, north of Oakwood Terrace. Adolphus Dendy was a District Chairman in 1907, and also landlord of the Ship pub. In the 1918 Kelly directory, Adolphus Dendy is listed as carriage & motor dealer. has been dissolved by mutual consent as from the thirteenth day of December 1936. All debts due and owing to or by the late firm win be respectively received and paid by the said Berne Cyril Dendy. The said business will be carried on in the future by the said Bertie Cyril Dendy. —As witness our hands this 25th day of January 1937. MITCHAM’S SOLE AGENTS B. C. Dendy and Co.. Ltd., 180, London-road, Mitcham, has an advantage over other motor-dealers in Mitcham as he is the only agent in Mitcham for Morris and Ford cars. This advantage is also an advantage for prospective buyers of cars residing within easy reach of Mitcham, as one is able to see the car one wants in comfort. Ford, of course, is known to all, as since 1903 the Ford organisation has made and sold over 25,000,000 ears. This unique record in manufacturing has only been made possible by the unusual value which Ford cars offer. The Ford “Ten” is the latest addition to Ford high-value ears, and one of the most outstanding announced for many years. It marks a new stage in the evolution of enjoyable but inexpensive motoring, offering exceptional roominess, high engineering quality. assured reliability, with remarkable economy. His other sole agency. that of Morris cars, gives prospective buyers the opportunity of examining cars which have a reputation for fast, safe, and comfortable riding. The Morris “24” is designed in such a way that the most careful attention has been paid to those three dominating points. The new overhead valve power unit has been thoroughly proved over an eveonsive mileage and combines surging power with the absolute reliability and smooth running for which Morris engines have been famed in the past. With a top speed of 70 miles per hour and an mildly impressive performance on the lower gears, it is more than capable of holding its own even with cars of much higher horsepower. It Is the car for the man who desires comfortable motoring. Listed in the 1938 commercial directory as B.C. Dendy & Co., motor car agents, 174 London Road. This entry was posted in Garages, Pubs, Roads and tagged 1915, 1918, 1925, 1937, Eveline Villas, London Road, Swan on November 18, 2018 by Mitcham Historian. Grove Lodge Garage was described in a news item on page 1 of the 24th February, 1933, Mitcham News & Mercury, as being at Tramway Path, near Mitcham Station, and kept by Frank GUYATT, builder and contractor. Considerable damage was done by a fire which broke out shortly before six o’clock on Saturday morning at Grove Lodge Garage. The discovery was made by Mr George Potter, of London Road, who informed the police, and they summoned the Mitcham Fire Brigade..
Chief Officer Albert O. Wells promptly turned out with one engine and a complement of men. The other engine, also fully manned, followed shortly afterwards. There was a blizzard of snow at the time, and the firemen experienced great inconvenience. They found a large corrugated iron building ablaze from end to end. Plenty of hose and a good supply of water enabled the firemen successfully to cope with the outbreak and keep it from spreading. The direction of the wind helped them. The garage was burnt out, two motor cars and a miscellany of goods, machinery, etc. being destroyed, running into several hundreds of pounds. The fire attacked a neighbouring factory, but this was saved, though police and willing helpers salvaged a valuable quantity of chemical food stored therein to make sure the fire did not affect it. The firemen were handicapped by many tons of burning rubber refuse in the buildings, which caused dense fumes. Several tons of copies of the Talmud (Jewish books of law), which were unfolded and unbound, caught fire and were destroyed. At one time the blaze was so terrific that it was actually seen by a milkman in Carshalton Road, two miles away. Nobody was hurt, and the firemen left after several hours’ hard work, during which they had the satisfaction of saving some very valuable property. The chemical food referred to may have been Lactagol. This entry was posted in Fire Service, Garages, Roads and tagged 1933, Albert Wells, Carshalton Road, Grove Lodge, Guyatt, Mitcham Fire Brigade, Tramway Path on September 17, 2018 by Mitcham Historian. This dates the photo to before 1967 which was when the Regent brand was changed to Texaco, according to Grace’s Guide to British Industrial History. Cranmer Motors was a garage that was near the present day roundabout with Madeira Road and Cricket Green. 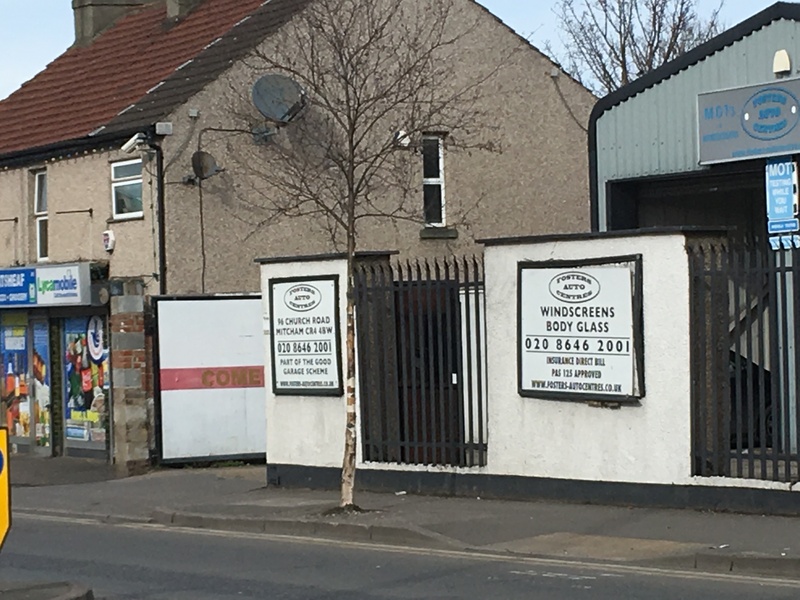 Although the 1953 OS map shows it between 76 and 94 Cricket Green, Cranmer Motors Ltd was listed in the 1963 Mitcham Borough List of Factories as Motor Vehicle Repairs, 1 Cranmer Road. Erection of a part 2 / part 3 storey building to accommodate 12 flats (9 x 2 and 3 x 1 bedrooms) together with 12 car parking spaces. Following air raid damage to residential properties during the Second World War, a garage forecourt replaced the destroyed houses on the study site, which by the 1970s was redeveloped as an Esso fuel filling station. Source: Pre-Construct Archaeology Ltd. 2008 An Archaeological Watching Brief at the Former Esso Petrol Station, Cranmer Road, Mitcham, London Borough of Merton. Volume 3, pages 104, Public Health and Burial Committee meeting of 11th September, 1917, a petrol licence for 150 gallons was issued to Mr G. Hart, Motor and Cycle Works, Cranmers Road. Minutes of meetings held by the Mitcham Urban District Council are available on request from the Merton Heritage and Local Studies Centre at Morden Library. This entry was posted in Cricket Green Conservation Area, Garages, Roads and tagged 1917, 1953, Cranmer Road, Cricket Green, Madeira Road on September 3, 2018 by Mitcham Historian. 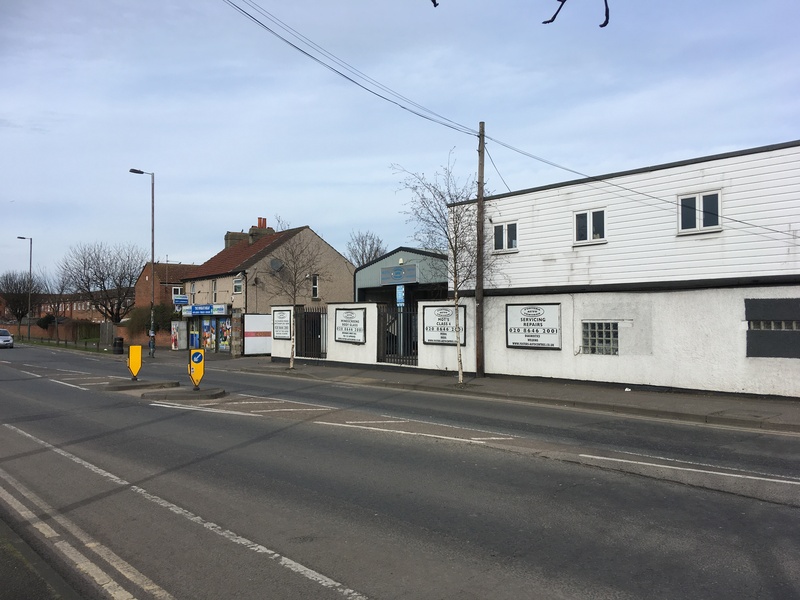 Garage and MOT business at 96 Church Road, occupying premises of former varnish factory of G. Purdom. Photo taken March 2018. On the left is the footpath Foxes Path, the Wheatsheaf. Photo taken March 2018, looking north. clip from merton Memories photo Mit_​Work_​Industry_​8-1 copyright London Borough of Merton. Renamed as B & D Clays and Chemicals Ltd., the company moved to Western Road in around 1983, according to a person on the Facebook Mitcham History group. This company currently trades from Willow Lane according to Companies House, which says the company incorporated in 1974. This entry was posted in Garages, Roads and tagged 2018, Church Road, Foxes Path, Willow Lane on March 24, 2018 by Mitcham Historian.